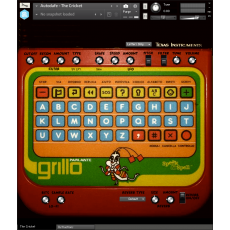 The Cricket is a Kontakt Instrument sampled from a "Grillo Parlante" (the same as a "Speak & Spell"). Grillo Parlante is Italian for "jimmy the Cricket" in Pinocchio story. The Cricket contains all samples from an Italian Speak and Spell. There are all single letters, all bleeps, all messages and 120 complete words, everything is in Italian Language. There are 7 Sets of samples, selectable with a menu in the upper part. Letters are also playable by clicking on the corresponding button in the UI. White keys on C1 octave contain various bleeps. The Samples folder in the ZIP file contains all samples in WAV format for use in any other sampler or DAW.